The successful Metal Masters clinic series, which has been growing since it started four years ago, returns this January with what promises to be its most impressive concert to date. Metal Masters 5 will take place in Anaheim, California on January 22nd at the House Of Blues, marking the first time this legendary series plays in Anaheim. Doors will open at 8:00PM with the show starting at 9:00PM. The event will be streamed live worldwide via GearGods.net for those around the globe unable to attend. Metal Masters 5 is bringing back some of the best performers from the previous clinics while adding some new faces as well as some unannounced surprises. As always, fans can expect unforgettable performances, instructional lessons and once-in-a-lifetime musical partnerships. 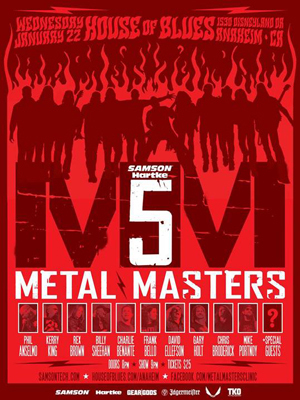 Metal Masters 5 will be comprised of Philip Anselmo (PANTERA/DOWN), Kerry King (SLAYER), Gary Holt (SLAYER/EXODUS), Charlie Benante (ANTHRAX), Frank Bello (ANTHRAX), David Ellefson (MEGADETH), Chris Broderick (MEGADETH), Billy Sheehan (WINERY DOGS), Mike Portnoy (WINERY DOGS) and newly added master Rex Brown (PANTERA/KILL DEVIL HILL). More additions will be announced in the upcoming weeks and the lineup is always subject to change. If the still circulating buzz from Metal Masters 4 is any indication, Metal Masters 5 will not disappoint. Metal Masters 4 marked the clinic’s return to New York City where it played before a sold-out crowd at the Gramercy Theater. The evening featured musical clinics by Frank Bello, Scott Ian, Billy Sheehan, Charlie Benante and an opening set by PHILM featuring Dave Lombardo. The concert finale that night was one for the ages featuring metal classics such as ANTHRAX’s “Room For One More", PANTERA’s “Mouth For War” and “5 Minutes Alone” as well as SLAYER’s “Chemical Warfare”, to name a few. The 13-song set let the crowd know they had just witnessed a once in a lifetime moment. Tickets are available for $25 and can be purchased at http://tinyurl.com/metalmasters5. With door giveaways and surprise guests, all should purchase their tickets early for this All Ages event to witness Metal Masters 5 live from Anaheim.